Members of the Army Reserve Marksmanship Program competed at an international small arms competition in Canada on the Connaught Ranges on September 7-19 in Ottawa, Ontario. The Canadian Armed Forces Small Arms Concentration (CAFSAC) is the largest Service Conditions match in Canada and is open to NATO allies. In addition to Canada Armed Forces regular and reserve personnel, the Canadian Rangers, British Army Combat Shooting Team and US Army Reserve Competition Marksmanship Program competed. Service Conditions shooting emphasizes military skill and fitness. All shooting is done in issue uniform with full fighting order and done after some physical task, such as a road march, sprint, or obstacle course. Modern day Service Conditions matches have their beginning with the Commonwealth nations. The Dominion of Canada Rifle Association was founded in 1868 and incorporated by an Act of Parliament to promote and encourage the training of marksmanship throughout Canada. Bringing together thirty three independent rifle associations under one organization, the DCRA first had the Governor General, his Excellency Viscount Monck, as Patron of the Association, a position held to this day by the current Governor General. As with nearly all organizations forming in this era, the first events were of the “round bull” conventional variety. In 1908 events featuring figure targets were introduced and Service Conditions became its own discipline. The targets used in competition look the same as qualification but feature score rings. Figure 11 targets are full sized silhouettes depicting an aggressive bayonet-wielding foe. Figure 12 targets have a similar aggressor but the target encompasses only the head and shoulders. Other targets include the Figure 14 (Sniper window target or “Hun’s Head”), Precision Target (same target size as the Figure 12, but with more outer score rings and mounted on a KD screen), knock-down targets for Fire Team Assault (falling plates) matches, and remote controlled electronic “pop up” targets. Winners of these events are officially recognized for their accomplishments. The Queen’s Medal for Champion Shot was first instituted by Queen Victoria in 1869 as an award for the best military marksman of the year. It started in the British Army and the Canadians retain that tradition in their events. A Canadian soldier earning the Queen’s Medal will add the initials “Q.M.” to their official rank and title for the remainder of their service. For individual awards, CPT TJ Conners was top open shooter in the Vimy Match and won the Vanier Trophy for being the top open competitor. SSG Chris Allen won the Panjwayi match and CSM Steven Slee won LKOL Van Helden Trophy for being the top overall pistol shot. USARCMP won the Colt Canada Trophy for placing in the top four of open pistol and rifle competition, taken by the individual performances of CPT Conners, CSM Slee, MSG Lance Espinosa, SSG Chris Allen, and SSG Jason Godel. 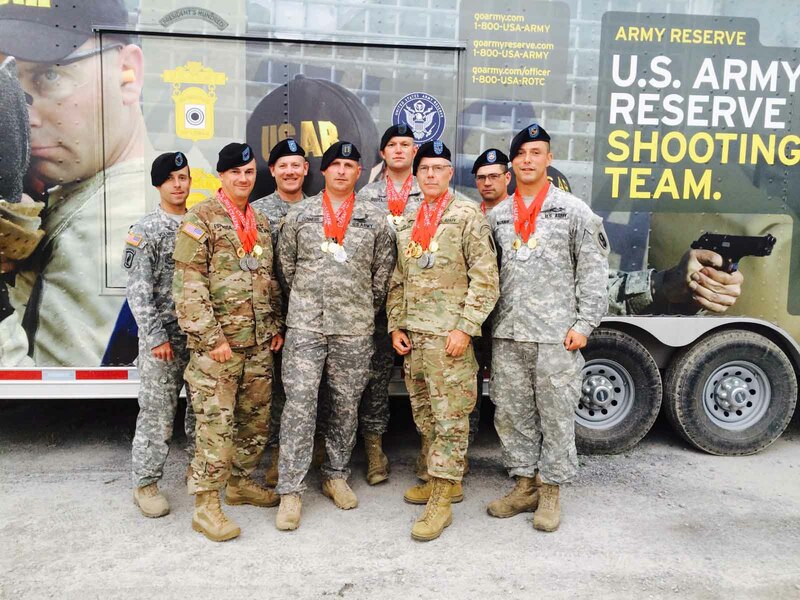 For team awards USAR Blue won the Samaranch Trophy for top pistol team. Firing members were CPT Conners, CSM Slee, MSG Espinosa, and SFC John Buol. Members of the USARCMP competed at the interational CAFSAC match in Canada. From left, SSG Volmer, MSG Espinosa, CW2 Knote, CPT Conners, SSG Godel, CSM Slee, SFC Buol, SSG Chris Allen. This entry was posted in Service Conditions-Combat and tagged CAFSAC, FY15-summary.